On Sunday, 2 November, 18 small Athenian Museums will be open to the public free of charge. 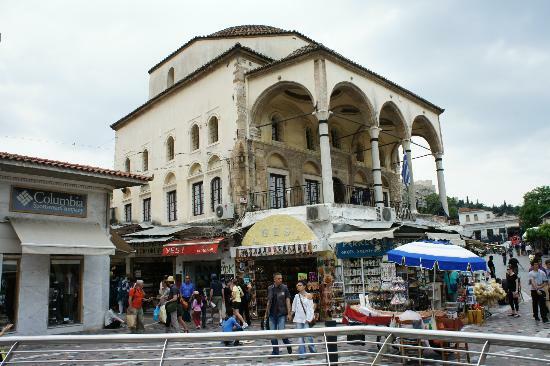 The museums are situated in central Athens and will be open from 11 to 16.00. I have to admit that I was unaware of at least half of these museums and have visited only one!! They cover a wide variety of subjects but are within easy reach of each other making visiting more than one easy and comfortable. A map of all the participating museums can be collected either in the Athens Jewish Museum (Nikis 39, Syntagma Square area) or the Popular art Museum in the Monastiraki area. In addition to the two mentioned above you can visit a Museum that houses a collection of the characters of the Greek shadow theater as used by Haridimos, one of the most famous players, painter Vassiliou’s studio under the Acropolis, the History of the Athens University Museum, a Museum dedicated to children and my favourite: the folk music instruments Museum. This last one is situated in the Plaka region, the old Athens, and has a minute garden, often used for performances during summer. Yesterday winter paid its first visit to Greece and found it, once again, totally unprepared. 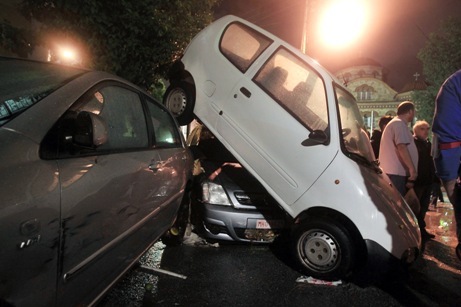 Flooded streets, cars carried by the waters for hundred of meters, damaged houses and destroyed businesses have become a common occurrence on Greek tv at every rainfall heavier than usual. Anti – flood infrastructure, projects that have been announced and never materialized are the cause of the biblical catastrophe most acutely felt in Western Athens, the poorest area of the Greek capital and Nikea, a Piraeus suburb. Angry and desperate citizens who feel totally deserted by the central government explained that this is a repeat performance for the last 30 years or so. The Prime Minister called an extraordinary meeting of the Civil protection Agency to coordinate the government’s actions on ways to face this natural disaster. Unfortunately, once again, Mr. Samaras exhibited an affinity for petty politics. He excluded from the meeting Ms. Rena Dourou, the newly-elected governor of the Attica region, the region most hit by the floods. Ms. Dourou represents SYRIZA, Mr. Samaras’ bogeyman. Ms. Dourou was with the citizens of the region and thanked the fire department for their unstinted help. After being left out of the extraordinary meeting she stated that this is not the time for petty criticism; the communities suffering once again know that such petty political behavior is the root cause of the lack of flood protection infrastructure. Interior Minister Argyris Dinopoulos, who visited some areas struck by the storms was booed by locals and blamed for the situation. People left homeless by the floods are being housed by their respective municipalities. The horticulturists among you already know that fasiolus is the scientific name for the bean family. 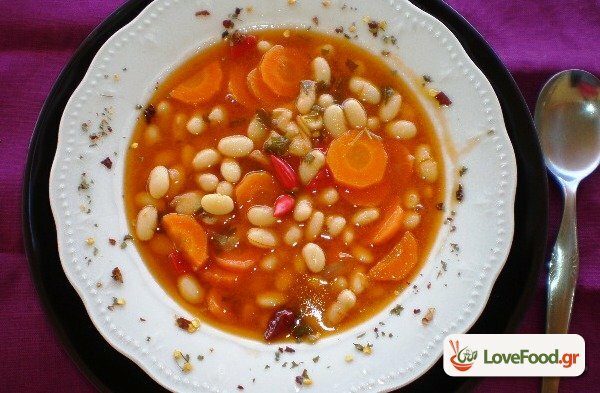 Fasolada is a soup made of white, dry, medium-sized beans, vegetables and herbs. While it is the Greeks’ favourite winter soup it is rarely found in the menu of a Greek restaurant abroad or of stylish restaurants at home. After puzzling over it for some time I have reached the conclusion that we are, silently, ashamed of fasolada: it reminds us of the time we were much poorer, when fasolia (beans) were the crop that kept us healthy and away from malnutrition. Beans grow easily on our mountainous areas, the mild Greek climate favours their growth and, after dried, they can be stored for months. We find fasolada mentioned a lot by Karaghiozi, the miserable, hunchbacked hero of the Greek shadow theater. During the German occupation beans and other legumes saved a lot of people from starvation. Fasolada is also the subject of quite a few jokes: Being cheap and nutritious it is very often served to our soldiers during their military service. Now, during the financial crisis, fasolada is taking its revenge. It is one of the main dishes in all collective kitchens. Restaurants are slower at adapting even though they serve all sorts of legumes fasolada is still taboo. Maybe due to its reputation of producing unpleasant effects during digestion..
Soak the beans overnight in cold water. Count about half a coffee mug per person. Dice 2 large carrots, chop 2 red onions and cut four sticks of celery into strips. Mix all ingredients in a large pot, add chopped ripe tomatoes or if not available a can of skinned and seeded tomatoes. Add pepper now and salt half an hour later. Before serving add a spoonful of virgin olive oil per person. Boil until the beans soften and the soup is thick. Serve with olives and a lot of fresh bread. The original fasolada is a vegetarian meal but you can adapt it to non-vegan friends by adding some sort of sausage or by using chicken or beef stock instead of water. There is also the “white” variation in which you do not use tomatoes but add oregano and lemon before serving. For colder climates add some chili peppers. Fasolada is an excellent source of protein, vitamins and minerals. It improves stamina and energy. Finally, in support of fasolada, I want torefer you to Umberto Eco’s article “It was the Bean that set the Pulses racing”, edited and translated by William Weaver from the Italian New York Times Syndicate. The song that best fits this year’s autumn is “it’s raining taxes”!! While the weather is being most charitable, few showers and enough chill to make the sunshine very welcome, our government is playing hide and seek with our nerves. 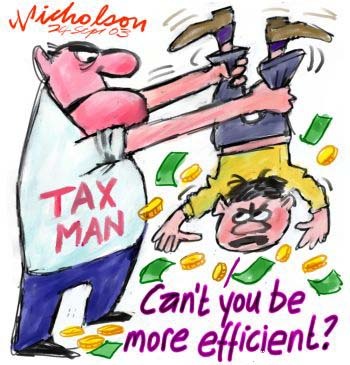 It’s pouring taxes on the Greek public. This is something we are used to in recent years… The most annoying thing this time is the inconsistency: taxes are imposed to be retracted because the calculation is wrong, deadlines are announced to be cancelled within a week, the number of installments are changed weekly and so on… This at a time when citizens’ trust to politicians has reached below zero temperature and with good reason.. Polls show a steep rise for SYRIZA (Coalition of Radical Left), the major opposition party, and the government’s react ion was to ask for a vote of confidence by the Parliament. The government got the go ahead by the Parliament with 155 votes. The opposition is asking for early elections while P.M. A. Samaras assures us of recovery. A most confusing time as you understand. If you add the international situation in our area it is a good thing that life carries on as usual. Visitors to Greece often wonder by the amount of people having coffee and even the sheer amount of coffee shops. I believe that this continuous contact with other people, relatives, friends, acquaintances and the solidarity among us, the plain people, is what keeps us sane and smiling.